As an organization that is constantly looking for opportunities to improve its processes, Capgemini understands the speed at which robotic automation can transform a business. However, it also understands that a lack of proper preparation before introducing robotics can lead to a start-and-stop implementation. With this in mind, the Capgemini Group identified an opportunity to automate the invoicing process of its Finance function in order to handle increased demand without compromising its stringent requirements for accuracy. As such, robotic process automation (RPA) offered an ideal solution. Capgemini’s Business Services Finance & Accounting (CBS FA) is a shared services team that provides a range of administrative services to the Group’s Finance function, including the processing of over 8,500 invoices manually every month. Invoice processing is a critical step for the realization of revenue and acts as upstream input for Capgemini’s entire order-to-cash (O2C) cycle, which is managed end-to-end by CBS FA’s dedicated team of project accountants via the Oracle R12 Project Accounting platform. The team was facing a range of operational challenges, including dealing with multiple processes and formats, ensuring the absolute accuracy of invoice data for a large volume of requests, comprehensive management of exceptions and fallouts within short timelines, and coordination of the entire process cycle with multiple stakeholders. In order to continue delivering seamless billing and revenue flow to the Group’s projects, the CBS FA team needed to increase efficiency through analyzing existing processes and eliminating non-value added process steps. This maximized client revenue and provided best-in-class utilization of the Group’s existing technology platform, application hub tools, and robotic methodology. Significant increase in “transaction per FTE” with 100% compliance on quality. All of this supported the goals of non-intrusive automation, seamless service delivery with the capacity for expansion, and the absorption of increased volume within the CBS FA team’s existing bandwidth. As a first step, CBS FA consulted project accountants directly involved in the invoicing process on the opportunities of RPA. This provided valuable information about how the team viewed RPA adoption as a means to move to higher-value functions. It also gave a detailed view of the challenges the project would need to address from an employee’s perspective while further outlining the project requirements and objectives. 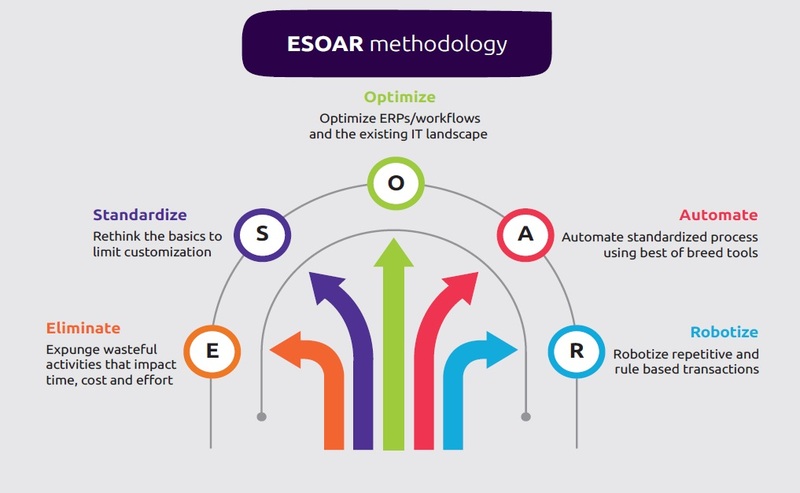 Based on this information, the CBS FA team developed and implemented the unique ESOAR (Eliminate, Standardize, Optimize, Automate and Robotize) methodology to holistically assess the needs of the Capgemini Group’s clients, agents, and managers at various steps of the invoice process in detail. This included eliminating multiple input formats from requestors, reducing manual handoffs, standardizing input and output requirements, optimizing the usage of the Oracle R12 for printing invoices and implementing robotics to automate repetitive tasks. CBS FA deployed UiPath’s industry-standard RPA product, part of Automation Drive, Capgemini’s unified approach on automation, which applies virtual robots to emulate and automate the manual activities involved in invoice creation, such as mouse cursor movements, keystrokes, and copy and pasting, and performing simple calculations and text string manipulations. This provided a real-time operating and decision-making environment, with robots constantly reporting their progress to a central server and an intuitive flowchart-style graphical interface enabling the team to design and implement the business processes as workflows. A robust control mechanism was also introduced to increase the accuracy of invoices and enhance client experience and satisfaction. CBS FA implemented proper controls throughout the project, leading to a smooth and successful rollout of its RPA solution for the Capgemini Group. In addition, the ESOAR methodology provided value addition and productivity gains for Group Finance by enabling the CBS FA team to approach the project with a strong plan that ensured smooth delivery. The solution assisted in reducing the turnaround time for invoice generation and improved invoice accuracy. There was significant reduction in queries in the downstream process, which led to better cash collection and enabled a reduction of days sales outstanding (DSO) for the Capgemini Group. Increased standardization—standardization of inputs resulted in fewer queries, exceptions, reworks, and manual handoffs. Successfully implementing robotics within its own Finance operations is an example of Capgemini’s ability to transform complex manual processes and apply best-in-class automation solutions. This project demonstrates Capgemini’s position as the trusted partner of choice for organizations wanting to transform their Finance function through implementing customized robotics solutions. The project also won the “Gold” category of the prestigious D.L. Shah Quality Award, recognizing CBS FA’s efforts in automating the invoicing processes for improved efficiency and service delivery. Continuous improvement—CBS FA’s people continue to generate new ideas on how repetitive, manual tasks can be automated or solved through robotics. This is recognized across the Capgemini Group as a powerful example of data, technology and talent coming together to create value.